Aztec Ruins National Park is situated on the north bank of the Animas River in Aztec, New Mexico. This pueblo was constructed between 1110 and 1120 AD, and at its peak contained 405 rooms and 28 kivas. The ruins extend for several miles down the sides of the Animas River. Reconstruction is on going here. The park got its name from the early European settlers who thought that they had been constructed by the Aztecs. However, the ruins were actually built long before the existence of the Aztec Civilization. They were in fact occupied from pre-historic times, and people have farmed here for more than 3,000 years. It is believed that Aztec was constructed largely by the people of Chaco Canyon. After multiple droughts the Chacoans built smaller regional centers that were close to dependable water sources. Here, in Aztec, they found everything that a new culture would need. They had fertile soil and plenty of water. However, because they were in such an ideal situation it is believed that they were constantly under attack. In fact, there is much evidence that the Anasazi at Aztec were defeated at least once. 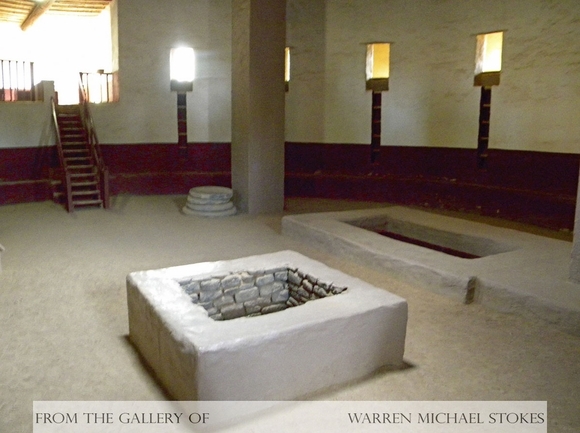 This is based on archaeological evidence that its Great Kiva was once burned. Remains of an irrigation system still exist. Everything about the earlier construction at Aztec represents a well planned Chaco Canyon community. They used open plazas and a style that can only be linked to their culture. Both Aztec, and nearby Salmon Ruins were both constructed at the same time, and then abandoned within 30 years. Then, 50 years later they were again occupied, only this time the people were from Mesa Verde. Archaeologists know this because in 1200 AD, the architectural styles became less decorative and stylish. In addition, they know this because the architectural styles closely resembled those found in Monte Verde. Aztec was again abandoned in the year 1252. Then a horrible drought struck this area from 1275 to 1300 and the entire region was abandoned. At this time it is believed that these people assimilated into other cultures. Some archaeologists believe that a majority of the residents moved into the Mesa Verde cliff dwellings. In the 1880's the people who lived in Aztec, New Mexico, broke into the first floor of the West Ruin looking for artifacts. They found that seven rooms with the roofs still intact. Exactly, what artifacts were discovered is unknown. The United States Park Service still uses the hole where they broke through as the entryway for its visitors. The great kiva here was restored by Earl Morris, and it is the only Anasazi building in existence that has been completely restored. Once inside the kiva we find a circular floor approximately 41 feet in the diameter and situated 8 feet below ground level. The inner sanctuary is encircled by 14 small rooms, and the pole roof is supported by four columns made of both stone and wood.